Eutelsat Communications has selected a new industrial partnership combining the expertise of EADS Astrium and ISRO, the Indian Space Research Organisation, to build a telecommunications satellite called Eutelsat W2M. W2M was to operate typically 26 transponders in Ku-band and up to 32 depending on operational modes, for a designed operational lifetime of 15 years. The new satellite is designed to provide additional security for customers and can be deployed at a number of orbital positions of the W satellite fleet, and in particular at the 10 degrees East position. W2M, like all the other Eutelsat satellites in the W series, displays great flexibility to operate a wide range of services from television broadcasting to data networks and broadband. In addition to a fixed beam coverage taking in Europe, North Africa and the Middle East, it was also to carry one steerable beam which can be re-oriented in orbit according to market requirements and notably towards Africa and central Asia, consolidating Eutelsat's high levels of commercial flexibility. According to the terms of the agreement, W2M was delivered to Eutelsat in 26 months for launch in the second quarter of 2008. This order was the first one resulting from the alliance of European EADS Astrium and Indian ANTRIX, the commercial arm of ISRO, the technical unit of which is the Indian Space Research Organisation. EADS Astrium was prime contractor in charge of overall programme management and will design and build the communications payload. ANTRIX/ISRO supplied the satellite bus, based on the flight proven I-3K (I-3000) model, and integrated and tested the spacecraft. The W2M spacecraft had a launch mass of about 3 tons and payload power of about 4 kW. 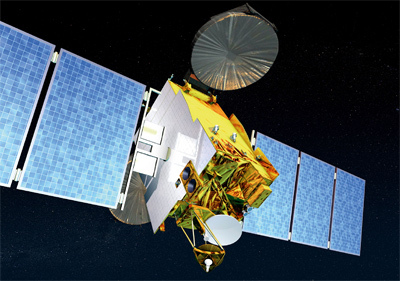 Eutelsat W2M suffered a major anomaly affecting the satellite's power subsystem. This anomaly occurred during the satellite's transfer from the location used for in-orbit tests to its operating position at 16 degrees East where its mission was to replace well in advance Eutelsat's W2 satellite. In the interests of protecting continuity of service for clients leasing capacity at the 16 degrees East position, Eutelsat has consequently taken the decision that in the current circumstances W2M will not be integrated into Eutelsat's satellite fleet. Currently under the control of ISRO, the satellite is undergoing a full technical investigation by ISRO and EADS. In late January 2010, W2M was integrated in the Eutelsat fleet providing limited back-up services for the failed W2 satellite. In December 2011 Eutelsat announced, that their satellite assets will be renamed under a unified brand name effective from March 2012. W2M became Eutelsat 48B. In late 2012 it was moved to 28.5° East and was renamed Eutelsat 28B. In January 2014, the satellite was leased to the Afghanistan Ministry of Communications and Information. Under the multiyear agreement, Eutelsat will move the spacecraft from its current slot at 28.5° east to 48° east by the end of February 2014. From there, the satellite, rebranded as Afghansat 1, will cover the whole of Afghan’s national territory and a large slice of the Middle East and Central Asia.